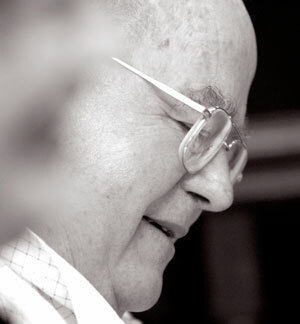 Australian poet, writer and teacher, Denis Kevans was the voice that turned hundreds of environmental preservation campaigns and human rights concerns into ditties, songs, verse and script. A Kevans poem became the fiat on any issue, from a local council zoning matter to the stance to take on a foreign war. Australia’s Poet Lorikeet, Denis was also called the “people's poet" because of his close identification with the workers' movement, Aborigines, migrants, the environment, anti-corruption and sport. He had a quick wit and wrote many humorous poems, deftly capturing the Australian vernacular. Peter Denis Kevans was born in Canberra on 15th January, 1939. He won a scholarship to St Josephs College in Sydney, where he played for the first XI (cricket) and first XV (rugby union). 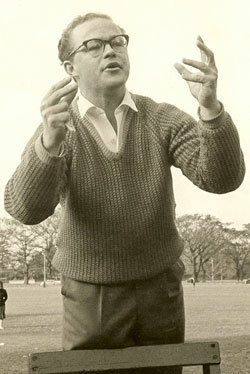 Denis was selected by Sir Robert Menzies for the Prime Minister's XI, which played the touring English (MCC) team in 1959. Here's an image. 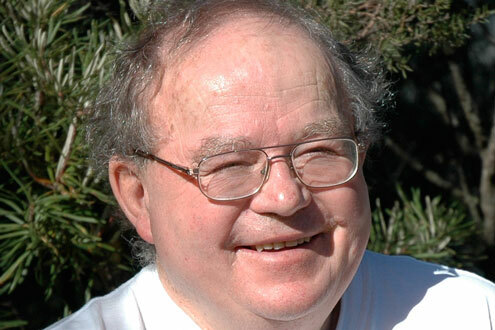 In 1982 Denis retired from teaching English and History in Sydney and moved to the Blue Mountains to concentrate on writing. Galleries of Art and Sculpture that are proudest in their fame? Is an Art no skill can master but the Mountain’s skill alone. From his home in Wentworth Falls, he became involved in battles over development projects and poorly-planned schemes threatening conservation. He wrote bitingly satirical poems about the involvement of local and state politicians, “half-smart thieves”, in shady development deals1. 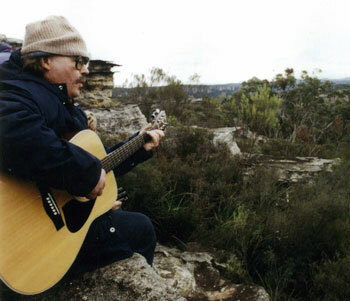 In 1995, he established a long-running monthly poetry performance evening, “Poets at the Parakeet” in Katoomba. A natural scholar and teacher, he mentored local aspiring poets and reciters - some of whom can still be seen in the mountains and around Australia performing his work. edited by Jim Haynes, ABC Books, Sydney (2008). His poetry has been recorded into song by over 100 singers including pro-conservationist Sonia Bennett, the Honorable Peter Garrett AM of Midnight Oil, and Wentworth Falls locals Margaret and Bob Fagan, as well as Leura poet, singer, song-writer and academic Kate Fagan. Denis’s work has been featured in public places in the mountains for decades. 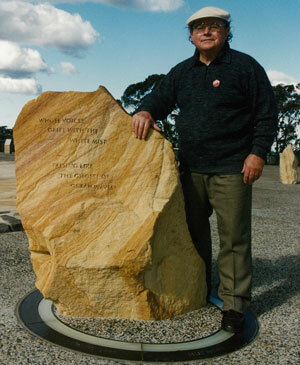 Notably lines from “Passing Mist” are inscribed in a World Heritage sandstone plinth at Echo Point, Katoomba. As an irreverent dissector of Australian and international politics, Denis was pleasantly surprised by an invitation to recite at an official function for the President of Sinn Fein, Gerry Adams at the Parliament of New South Wales. Denis lived in Wentworth Falls for the remainder of his life. 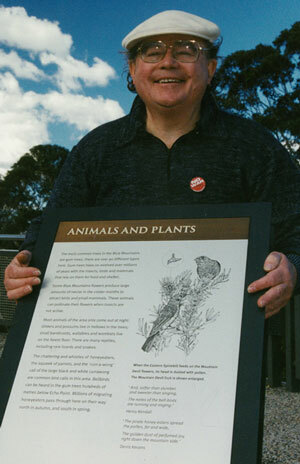 In 2009, the Blue Mountains City Council posthumously named a reserve in Wentworth Falls the “Denis Kevans Bushland Gardens” inspired by his poem “Bushland Gardens”. The poem extols the innate beauty of Australia’s native bush. It is a touching tribute as he had regularly walked through the same reserve on his way to the Wentworth Falls town centre. Immortalised in magic verse – and I thank you, Denis Kevans. Denis’s daughter Sophia restored his Wentworth Falls home and named it Poet’s Cottage in memoriam. In 2013 the cottage opened as a holiday home for travelers with an interest in poetry and nature. Denis with plinth at Echo Pt. That is the face you cannot remember. Who is walking in the mist with their sandals in their hand? Who is crouching to see the orchid smile? Thrown by the harmonica bird at the covered sun? Whose voices are under the waterfall? Whose voices are muffled by the mist? Passing, like the ghosts of ocean waves? right down the mountain side. Australia's bushland gardens where the ferns and flowers grow. Our bushland garden's blooming, and the ferns and flowers grow. Where Australia's bushland gardens grow their beauty for us all. Is the lyrebird of loveliness who rakes the gardens there. Along the fronds of flowers, and the green ferns' dancing stems. And plunder honey-lanterns with their wanton little tongues. Turn singing creeks and waterfalls to a putrid, stinking drain. And keep them for the world. To the evening's rushes of red. By the bones of the gravel bed? Without moving a feather so trim. For the king of the Mountains, was him. Carried him here and there. When I met the king that day. Denis Kevans' work is subject to copyright. Permission must be sought to reproduce any or part of these poems from his daughter Sophia, who can be contacted through this website or via the Denis Kevans' Facebook page. Biography written by Sophia Kevans with excerpts from the Sydney Morning Herald obituary of Denis Kevans “Witty Voice of a Humane Generation” by Jefferson Lee, September 17, 2005.